The religious activities for this year’s celebration of the feast of the Sto. Nino kicked off January 9th with the start of the nine day novena. Religious organizing head, Fr. Jonas Mejares said the customary nine novena will kick off tomorrow with a solemn procession “Walk with Jesus” from the Fuente Osmena Circle to the Basilica del Sto. Nino at 4 am. The installation of this year’s Hermano and Hermana will also be conducted. Mejares said, the nine day novena masses from January 9-19 will already have an additional 11th mass for devotees to attend. On the cultural side, the opening parade of the Sinulog festivities will begin on Friday January 10 with the opening of the Trade Fair at SM City, 10 in the morning and the launching parade at 3pm from the Basilica del Sto. Nino to the Cebu City Sports Complex. There will be nightly entertainment at the Fuente Osmena circle beginning that day. 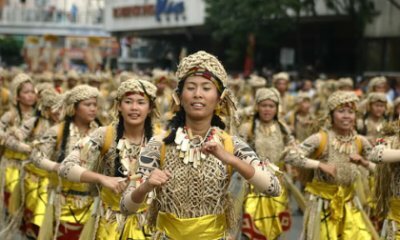 Sinulog sa Kabataan Lalawigan is scheduled on January 11 with 10 contingents and happening the next day 12th, is the Sinulog sa Kabataan-Dakbayan with 12 participants. Ticket price for the Sinulog sa Kabataan is at P75. Other activities include Balikbayan Airport Welcome beginning January 15 in the morning and also the coronation of Miss Cebu 2013 in the evening at the Waterfront Hotel in Lahug. The annual Cebu Pop Music Festival is scheduled on January 17. The image of the Sto. Nino will be brought to Mandaue City at the National Shrine of St. Joseph for a night on the 17th and it will be returned to Cebu City thru the customary fluvial parade the next day. The fluvial parade is also followed with the reenactment of the arrival of Portugese Ferdinand Magellan to the shores of Cebu and welcomed by the leader of the natives Rajah Humabon. On Sinulog day, January 19, the festival will start at 9 in the morning and will culminate with a display of fireworks after the grand finale. Police and traffic personnel had already imposed security measures as early as tomorrow and also issued rerouting plans.